Oklahoma State Penitentiary's new Warden, Mike Carpenter, shakes hands with Board of Corrections members after his appointment approval on Thursday during the agency's monthly board meeting at Mack Alford Correctional Center in Stringtown. Carpenter has more than 30 years of experience at the Oklahoma Department of Corrections, and takes over the state's oldest prison after serving as its interim Warden since July. 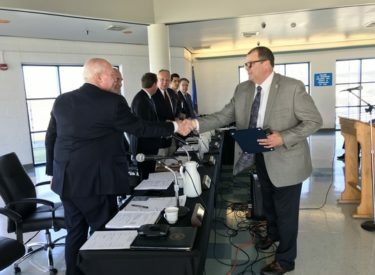 STRINGTOWN — The Board of Corrections voted unanimously Thursday to approve Mike Carpenter’s hiring as Warden at Oklahoma State Penitentiary. Carpenter, a veteran Oklahoma Department of Corrections leader and staff member of more than 30 years, was most recently OSP’s interim warden, a post which he has held since July. He was also serving as Deputy Chief of Operations. Carpenter’s previous posts include Chief of Security at Joseph Harp Correctional Center, Security and Facility Operations Manager for Division III, Director of Special Operations, Chief of Security at Lexington Assessment & Reception Center, and Director of Technology and Emergency Operations. Among numerous career accolades with ODOC, Carpenter was instrumental in the agency’s adoption of the Incident Command System. Built by inmates in 1908 in McAlester, OSP is the state’s oldest prison, and is home to its male death row unit. It houses 863 inmates.